I wish to begin with a Big Thank You to all the people who contributed to making Gaia Gardens, and my initiation as a farmer, one intensely profound experience. First and foremost, my co-conspirator and dearest friend Dominique, who makes beauty of whatever she touches and helped hold a loving space for all the people who came to the farm. To the volunteers who made us feel like a family and fed the holy fire of community. To all the sweet people at the Farmers’ Market, who cheered us on all along, whether they were our customers or not. To all the farmers I befriended and fell in love with. To all the organizations and sponsors who understood our worthy and noble cause. To my cat, who constantly made me laugh and reminded me to always stay somewhat feral. To the teacher who inspired me to look at soil as what a farmer really grows. To our neighbor, who through her determination to destroy the farm, helped make us popular and successful. To all the city officials and food justice activists who helped bring more food security awareness to the community. To the Gaia Gardens property owner, who offered his land for farming so generously and stood by us all along. To the local Press who did mostly a very good job at covering the issues and standing up for what’s right. To all the attorneys who helped us fend off an administration and neighbor bent on keeping the farm from operating. To all the residents of the Los Chamisos Homeowners Association, our direct neighbors, who saw the farm as an asset to the neighborhood and showered us with kindness. 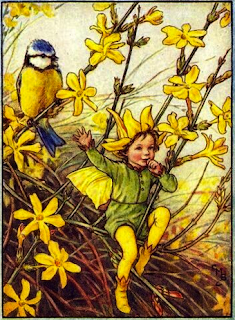 And finally to all the seed growers and seed keepers without whom this would not be written. Many people expressed their sadness at the farm closing and my relocating to Colorado. Of course it is sad when a beautiful community hub like Gaia Gardens disappears. Many of us understand how beneficial a vibrant and welcoming farm can be to a neighborhood. Of course it is sad to have so many people are deprived of the opportunity to stop by the farm and dip into a dynamic oasis of fertility and human interactions. It is sad for me to no longer be able to hold a place for community to gather. For me the farm was way more than growing food. Just like a Café is more than just about coffee. These places always serve an essential function in the building of community. People need to interact socially for some fundamental soul nourishment. On a farm, people also get to interact with a vibrant and self-reflective ecosystem. Together with the farm, we learn. How to grow food. How to grow as people. How to grow as community. I am personally pleased with the amount of human relationships we helped weave. Through our community potlucks, open-house policy, volunteer time and at the Farmers’ Market. For me it is probably the most important measure of our success. We made friends and felt very loved. It is my hope that what we accomplished, with community cooperation and very little resources, will inspire others with vision and passion to keep re-greening the city with a tapestry of “farm-gardens”, where people trade their crops or buy from their neighbors. Where paths connect gardens so children can play and the wildlife has a home in the city. Over the course of four years of farming near an arroyo, I experienced a connection and communication with birds that I wish every child on Earth to have. Birds seem to know who the farmer is, the one who cultivates plants and supports the birth of seeds, season after season. They see you everyday in the garden. They always hide in the bush near where you pee in the morning, and seem to chirp you up for a good day. They come for food and water but stay around the farm-their home. After we closed the farm, Dominique and I committed to planting the next season for the wildlife. And we did. 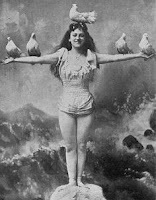 And that makes me very happy to have made so many friends with so many birds. 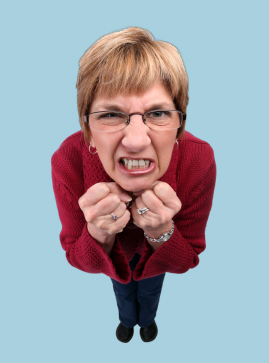 The difficulties we encountered from a neighbor’s opposition and a less than enlightened City administration dramatically increased my workload and stress level. Farming in itself is difficult enough without having to spend countless hours in meetings with attorneys, and being seriously impaired in our ability to operate freely as an educational center. When I started Gaia Gardens, I already knew that the property was in foreclosure. I was willing to take a chance, and attempt to make a positive impact on the City, even if I only had a year to do so. Circumstances made it so that we were able to farm for four seasons. The uncertainty about the future of the property was a strong factor in making the decision to close the farm. But it was not the only reason. My stress level made me brittle. I wasn’t operating at my best. My workload-farming year-round, writing grants, working with school gardens, dealing with a bureaucratic firestorm, helping draft an urban farming ordinance and managing the 7-unit rental property that the farm was located on, was an initiation of tough proportion. My nervous system and Soul were ready for a break. When we began working together, Dominique and I had just met. She rented a studio on the farm. She jumped right in while also finishing her Masters degree and working as a Massage Therapist. The farm workload and stress increased for her as well. Without her complete devotion to people, plants and animals, the farm would have never been what it was. As much as the economics of Gaia Gardens were successful by all standards, we also depended on small grants, donations and paid work at school gardens. For me, it became increasingly difficult to work so hard while making so little money. I had to be honest with the imbalance in my life. I was working to nourish people yet felt depleted. Dominique and I assessed that we had done our best, learned a lot, touched a lot of people, fed an abundance of wildlife and survived our friendship. We both intuitively knew that it was time to wrap it up and move on to new creative endeavors dear to our hearts. I took a year off, went traveling, promoted a documentary that was made on the farm, got immersed in the Bernie fever, started dancing again, went to Standing Rock and began exploring where I would be drawn and inspired to acquire land for the MilAbrazos Community Land Trust, which was birthed out of the farm momentum. After six months of looking for land, I have chosen to relocate to Paonia, on the Western Slopes of Colorado. It is and adorable and creative agricultural community that has welcomed me with a warm heart. Should your whereabouts take you to this part of the West, feel free to stop by for a visit. I will miss my friends in Santa Fe and will visit once in a while. Thank you again for all the Love and support you gave us! I had the privilege of spending much of this growing season as an intern at Gaia Gardens. Over the past seven months, I experienced the natural shifts in weather and tasks from spring to summer to fall, as well as several models of marketing and engaging with the surrounding community. I learned more than I ever imagined about gardening, the demands of running a small business, the potential of urban farms, and the daunting legal and political challenges they can face. Now as the season draws to its final, hastened end, I am left at once grateful, inspired, and disillusioned. I arrived in early March to a flurry of seeding, transplanting, and on occasion, snow. At the time, Poki and Dominique were optimistic that the urban farming ordinance that had been drafted and circulated the previous year would soon pass, and were looking forward to welcoming more school groups, hosting workshops, and reopening the farm stand. In the meantime, we spent nearly a third of our time working in two school gardens and selling seeds and plant starts at the Santa Fe Farmer’s Market. For a time, I found it exciting and fun to work the market. I was energized by the buzz of interactions, the faces that soon grew familiar, the spontaneous moments of connection with strangers passing through, the camaraderie and admiration and support among vendors. But by mid-summer, I was also weary of the hours of loading and unloading a truck stacked high with bins and tables, hundreds of seedlings, crate after heavy crate of gallon pot tomatoes. When we finally freed ourselves, in a frenzy of giving, from the last of the plant starts, I was deeply relieved and ready to let go of the most stressful part of each week, as well as intrigued to see the farm stand unfold. I soon understood why Poki and Dominique had been so eager and fought so hard to reopen the farm stand. I cannot imagine a more ideal space, right off a major bike trail, in the heart of the garden, where people could sit in the shade and enjoy a free cup of herbal tea grown on the farm, or walk through the garden to admire the flowers and see where and how the produce they purchased grew, just feet away. A few familiar friends and neighbors dropped by, thrilled to finally be able to walk down the street to chat and buy their produce for the week. Most of the people who came to the stand I had never seen before. Some had walked or biked by the farm every day on their way to work, wondering at the flowers along the fence, and were excited to be invited in through the open gate. Others happened to be passing by on a ride through town and were curious and excited to discover a farm in the city. One such young couple in particular are engraved in my memory. They came in from the bike trail, bought a bunch of kale and a bundle of carrots, and meandered through the garden. They eventually found their way to the “dragon bench,” lovingly shaped and plastered with straw and clay by volunteers, nibbled their way through the carrots, then headed up the hill to feed the carrot tops to the chickens. I found them in front of the coop several minutes later, still tossing the leaves piece by piece to the chickens, laughing, playful, teasing, entranced. I wondered if they had ever fed chickens before. Yes, I thought, it was moments like these, far more than the meager sum we earned, that made the farm stand worthwhile and critical. On a practical level, the farm stand took a fraction of the time, effort, fuel, and heavy lifting of the Farmer’s Market. For months, we had spent at least five or six hours each week first loading the truck for market, then leaving before dawn, driving three miles away, and scrambling to unload and set up our stand, only to pack everything carefully back into bins a few hours later, load them back onto the truck, make the short drive back to the farm, and unload all of our supplies again. Now, instead, we could rise with the sun, quickly set up and harvest for the farm stand from within the garden, and work in the surrounding fields during lulls between customers. We could harvest just a modest amount of each vegetable, much of it that same morning, and restock as necessary. This saved us from having to figure out how to store or use up a giant harvest if sales were slow on a given day. It also meant the freshest produce possible for customers, and less going to waste. And we were providing fresh organic vegetables to a completely different clientele not already served by scores of other growers at the Santa Fe Farmer’s Market. What many people don’t seem to realize is that producing and selling food was only a small part of what the farm offered, or could have if it were given the freedom to. All along, the purpose of Gaia Gardens was to provide a space for people to tangibly contribute, learn by doing, share their experience and skills, and in the process, forge connections with the natural world and each other. First and foremost, the farm aimed to demonstrate, refine, and teach ecological food production methods, as well as model “bootstrapping” a farm by diverting waste and utilizing inexpensive local resources. (Rain catchment, composting food scraps from local restaurants, recycling used potting soil, and using salvaged building materials, to name a few.) Ironically, the farm stand became the central focus of the controversy around Gaia Gardens and urban farming in Santa Fe, but I believe it was actually the city’s over-zealous restrictions on school visits, volunteer groups, workshops, and community events that most undermined the spirit and promise of the farm. We knew when we opened the farm stand that our days were numbered. The morning before, we had been informed that the property owner was not willing to consider a short-sale, and there no longer remained a viable option for securing the land. I spent most of the day clearing the dirt paths to the garden and carefully lining them with stones, shrouded in sadness. Mourning the loss of such a treasure of a place, where so many had invested their energy, dreams, sweat, and skills; found solace, inspiration, healing, and new ideas; laughed, deepened friendships, shared a meal, chomped on a lemon cucumber or scarlet runner bean right off the vine. Where barren ground had been built and nourished each year, transformed into rich soil prime for food production, and constantly fluttering with birds and pollinators. I looked back through the fence at the waving fronds of cosmos, the tidy rows of vegetables, land that had passed through so many manifestations and transformations over the years, loved and abused, a stage and silent witness to the rise and fall of human ambitions and dreams, patient, enduring. A quiet assurance that even as this chapter was drawing to a close, the story of the land was far from over. A few stones have been kicked out of place, but the paths still lead to the garden gate and through the fields, still beckon neighbors and friends and passer-bys, winged and human alike, to wander through a labyrinth of rows still blooming, still teeming with rich soil and seeds and a universe of subterrestrial life. Yet we must continue on our own winding paths, hoping, praying, trusting that in some way -- in the unknown mystery of seeds burrowed and stirring beneath the crust of the earth -- the legacy of growing, nurturing, connecting, and sharing will live on, here on this pinprick of the planet and in this community. Blessings to all of you who have enriched this place and my time here. The purpose of the meeting was for the Mayor and his senior staff to hear about what Gaia Gardens has been going through in the past 4 years and why we decided to quit. I told them that they needed to educate their staff about how fragile an undertaking an urban farm is, and that before looking for what's "wrong" with a project like Gaia Gardens and slapping the property with a Notice of Violation amounting to a death sentence, they should look at what's "right" with a situation and help the project instead of trying to shut it down as they did. I sent the meeting participants a "Chronology of Events" ahead of the meeting (see below). The Mayor apologized for all of our troubles at the onset of the meeting. I explained how, before we began breaking ground at the farm, the property owner and I met with five senior Land Use planners in early 2012 to present what we intended to do (farming, education, etc.) and to seek guidance. We were given their blessings. See below a history of our dealings with the City administration. There are 23 referenced attachments that you can download at once here). Mr. Tallmon and Mr. Piottin meet with five Land Use and Water Division staff (including Heather Lamboy and Tamara Baer) to present the farm project and request guidance (See attachment 3 - Presentation to Land Use Feb. 17, 2012). Land Use staff doesn’t foresee any issues with our plan, states that the only thing to be aware of is the farm can’t sell off the premises. Land Use staff never mentions that the farm needs to apply for a Home Occupation License. Mr. Piottin, having been accepted as a Santa Fe Farmers’ Market vendor applies for a City of Santa Fe Business License. Vince Daniels at the City Business License Office, after hearing from Mr. Piottin that Gaia Gardens is operating a farm in the City limit and needs a Business License, tells Mr. Piottin that a Farmers Market Vendor Business License is all that is required. Mr. Daniels never mentions the need for Mr. Piottin to apply for a Home Occupation License. Business License # 12-00116243 is issued on that date. Mr. Piottin has renewed his Farmers’ Market Vendor Business License each year since then. Mr. Piottin emails Mayor Coss and informs him of the farm stand operating successfully in 2012 and requests help to obtain a variance to continue the farm stand (See attachment 6 - Letter to Mayor Coss). Mayor Coss never responds to Mr. Piottin’s email. Tom Watson, an elder and friend of the farm, takes it upon himself to visit Matt O’Reilly, then Director of Land Use. Mr. Watson reports to Mr. Piottin the next day that he met with both Matt O’Reilly and Patti Bushee, and his assessment on the meeting is that “the City wants to shut down the farm” and that the farm in their view is "an inappropriate use in a residential zoning". Land Use Inspectors visit the farm on at least 5 occasions, looking at all areas of the farm operation. Mr. Piottin cooperates and lets them on the property without dispute. All inspectors are very courteous. Gaia Gardens received the Santa Fe Sustainable Commission's Award for "Best Sustainable Food System". After Matt O’Reilly requests complete access to all the property dwellings for inspection, a group of inspectors from water, grading, electrical and plumbing departments meticulously inspect the property for any building violation. Matt O'Reilly having informed Mr. Piottin that he could not live in the trailer that was parked on the farm property, Mr. Piottin begins researching the issue, and posts an ad on Craigslist asking the public whether the City has enforced this against others (See attachment 15 - Posted on Craigslist 06-30-2013). In the farm neighborhood alone, Mr. Piottin can easily point to several residents living in trailers. Matt O’Reilly calls Kyle Harwood, an attorney helping us at the time, asking him if “we were planning to file a lawsuit against the City”. Kyle Hardwood contacts Mr. Piottin to ask if he had posted the ad on Craigslist. Mr. Piottin deletes the Craigslist ad that same day. After Mayor Gonzales comes into office, Mr. Piottin sends Noah Berke, Planning and Policy Administrator for the Mayor, the Proposed Elements for Urban Agricultural Ordinance document. Mr. Piottin meets with Mr. Berke to discuss the creation of an urban agriculture ordinance. Mr. Berke mentions that Katherine Mortimer, Sustainable Santa Fe Programs Manager for the City of Santa Fe, is being considered to lead that effort. Mr. Piottin, Ms. Pozo, co-founder of Gaia Gardens, legal counsel Gretchen Elsner and three Gaia Gardens interns meet with Ms. Mortimer to begin a discussion on the details of an urban agriculture ordinance. Mr. Piottin, Ms. Pozo, legal counsel Gretchen Elsner and several Gaia Gardens interns continue to work with Ms. Mortimer to further draft the details of an urban agriculture ordinance. (See attachment 21 - Sample of Communications with Katherine Mortimer). The City appeared not to be making any progress toward having a public meeting or finishing a draft of the ordinance, but the proposed ordinance draft does make clear that farm stand will be allowed. John Alejandro, Renewable Energy Planner for the City of Santa Fe, invites Mr. Piottin to become a member of a newly created Urban Agriculture Committee. Mr. Alejandro is replacing Ms. Mortimer as the person in charge of creating an Urban Agriculture Ordinance. Mr. Piottin participates in several meetings until his resignation from the committee on August 13, 2015. On two occasions, during meetings of the Urban Agriculture Committee, Mr. Piottin asks Mr. Alejandro to help the farm find a way to get a permit for the farm stand that the farm plans to open in July 2015. Mr. Alejandro states both times that he will work on Mr. Piottin’s request with the Land Use staff. Mr. Piottin visits City Hall and meets with Lisa Martinez, Director of Land Use and Greg Smith, Division Planning Director of Land Use. Ms. Martinez and Mr. Smith state that they are looking into a way to legalize the farm stand, maybe using a special “neighborhood grocery” license. The documentary Bringing Food Home, centered on the Gaia Gardens’ story, premieres to a sold-out audience at the CCA. Ms. Martinez and Mr. Smith visit the farm to take a look at our operation. Farm stand is open that morning and several neighbors, including architect and neighbor Wayne Lloyd, are present to greet Ms. Martinez and Mr. Smith, and praise the farm for being a good neighbor. At the end of the visit, Lisa Martinez states that they will try to get a “pilot project”-type permit for the farm stand. Farm stand continues to operate 8:00am-12:00pm. 90% of farm stand customers are using the bike path, not creating traffic in the neighborhood, nor needing parking. 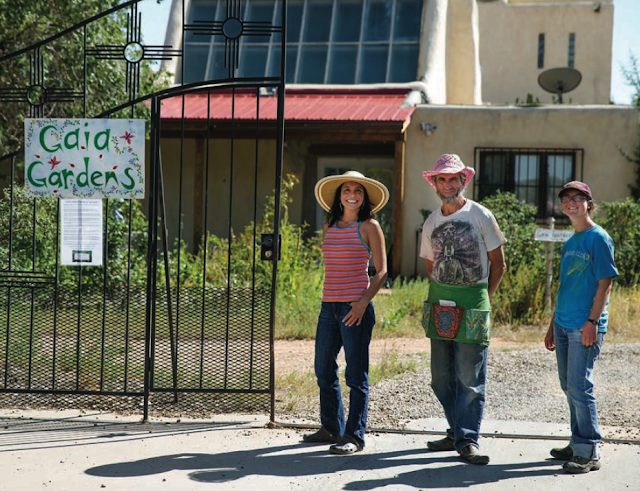 Mr. Piottin issues a press release stating that Gaia Gardens has made a decision to stop farming in the City of Santa Fe. Mr. Piottin submits his resignation from the Urban Agriculture Ordinance Committee to the Mayor and the Committee Chair John Alejandro. When Santa Fe forced Gaia Gardens to close, owners Poki Piottin and Dominique Pozo wanted their farm to die gracefully. The end of Poki and Pozo’s vision to teach holistic, self sustainable farming was punctuated by a liquidation sale September 12. 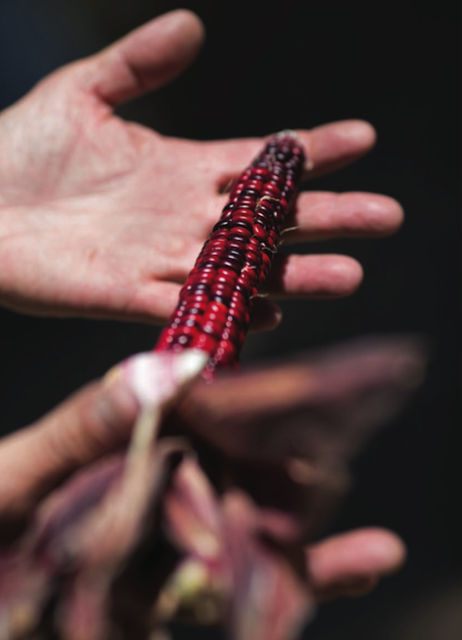 Rather than abandoning their creation immediately, the owners and their intern Rachel Brylawksi will stay with the final harvest until their last corn stalk is cut. “The garden is a living thing. It would be like abandoning a child hungry in the desert,” Pozo said. Before farming, Piottin was a businessman in Seattle. He worked for building contractors, an Internet company and owned his own dance and music club. Piottin pursued various other projects including teaching sacred dance and an urban farm in Washington. In 2012, he decided to start a similar agricultural project in Santa Fe after a vision. “I had a vision of farming again and working with young people,” he said. 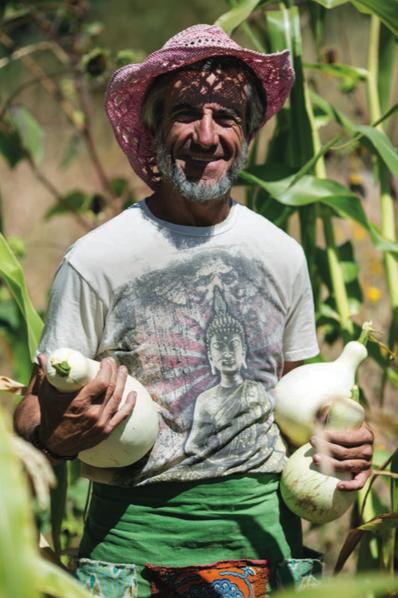 Alongside Pozo, he rented property along Arroyo Chamiso and they began to teach Santa Fe about sustainable, Biodynamic farming. Piottin said Biodynamic farming is a holistic understanding of agriculture that relies on the energy rather than solely the chemistry of plants. “Plants, trees; they have properties that are beyond the chemistry. Even the soil,” he said. Gaia Gardens teaches seven preparations for manure that cater to energy and health of their plants which include adding materials like chamomile and horsetail. Piottin’s business partner, Pozo, is a Doula, body worker and art therapist. She works with people suffering from eating disorders, and the farm has become a rewarding part of teaching her clients. “It’s looking at food through a different lens, as a miracle and a way to nourish your body,” she said. Pozo brings to the garden her knowledge of plants’ holistic and healing properties and used it to teach and help others. “The farm has been a labor of love. It was short lived but worth it,” Pozo said. The bulk of the farm’s legal hurdles began two years ago when a neighbor of Gaia Gardens overwhelmed the city Attorney’s office with complaints about the farm. Piottin and Pozo have worked endlessly to appease zoning ordinances, water rights and licensing, but finally gave up warring with the city. it impossible to operate as a business and school on residential property. In order to sustain, Gaia Gardens began selling their vegetables at the local Farmer’s Market. This business model proved too straining on Gaia Gardens’ 3.5 acres, volunteer operated farm, and so they stopped growing food for commercial use. During the somber liquidation sale, Pozo, Piottin and Brylawski were gracious hosts. Pozo greeted visitors and gave away wildflower seeds. Piottin offered glasses of apple juice as people browsed the yard sale, and Brylawski offered some of the lunch she made from fresh garden veggies. At the sale, Piottin spoke with a family of five. The youngest boy picked out an old bike tire and Piottin offered him a free helmet, concerned he might be riding without one. He sold the family a few armfuls of trinkets for one quarter. Piottin said helping people is his primary motivation. The Gaia Gardens trio will live on the property in foreclosure until their crops live out their natural life cycles, which could be until early December. Pozo will concentrate on her other jobs, Brylawski will move to a homestead in California and Piottin will keep looking for his next way to be of service. Our last potluck was magnificent. Thank you to all who attended, especially the musicians. Here are five music samples from the evening. Click on each image to listen. Last week, I filed a Request for Public Records at the City Attorney's office regarding the latest round of complaints about the farm. The person who recently sent a complaint to the City about our farm stand lives in.... Eldorado! That's exactly 18.4 mi from the farm! She is most likely an acquaintance of our immediate neighbor who's regularly been using proxies to wage her war on the farm and our water rights since 2013. Dct. Watkin called the City numerous times, including the City Attorney's office, and threatened litigation against the City if the farm wasn't shut down. True. We applied for one in 2013 but it was denied on the grounds that there were building violations on the property (having nothing to do with the farm). The City has let us operate the farm since then. False. On Jan. 16, 2014 the Office of the State Engineer granted us 1.05 acre-feet of irrigation water rights. The transfer of these water rights is currently being protested by the same neighbor who has tortured us to death for the past 3 years! While the Office of the State Engineer is conducting formal hearings on the protest, the use of water for irrigation from our domestic well is legal. False. The farm leases one acre of the property for its operation. We have worked with multiple lawyers over the last few years to see what the farm could do regarding the foreclosure, but as a tenant, we have been limited by the property owner’s actions and desires because he’s the party responsible for the foreclosure. Last year, we formed a community land trust and raised money to attempt to buy the property out of foreclosure, way more than a tenant would normally do. False. The only structure that was built (hoop houses do not require permits) is the garden structure that we had permitted in 2013 and later used for our short-lived farm stand! A previous shed structure built by another tenant without proper permits was torn down in 2013 upon request by the City. In anticipation of a meeting with Mayor Gonzalez next week, to discuss the Gaia Gardens situation, I am releasing the following letter sent to Mayor Coss in Jan. 2013. I sent the letter twice and never got a reply from Mayor Coss. 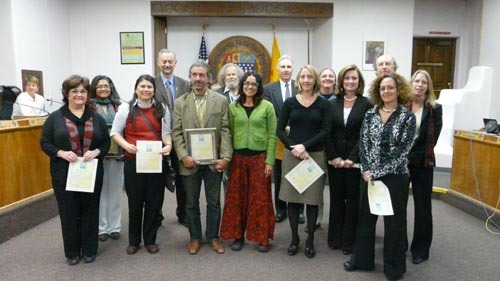 I most recently met you at the City Council session of Nov. 14, 2012, where Gaia Gardens received the "Best Recycler" award from the Santa Fe Green Chamber of Commerce, and two weeks ago at the Carbon Economy Series on Sustainable Tourism. I am writing to you to seek your guidance and support on two issues having to do with urban farming in residential zoning. With Gaia Gardens being located next to the Arroyo de los Chamisos Trail, many neighbors, bicyclists and walkers stop by to visit our beautiful garden. Upon their frequent requests in the Spring, we opened a small farm stand and sold produce three mornings a week during the summer months. Being a new non-profit, having that farm stand was an economic life saver since we were on a waiting list with the Santa Fe Farmers Market and could not get a booth on Saturdays until later in the summer. The farm stand sales accounted for nearly half of our income in 2012. Quandary #1 : According to city zoning codes, the sell of farm produce is apparently not allowed on our premises. I understand that one of the reasons for not allowing retail in residential zoning is related to noise and parking issues. In our situation, 90% of our customers come on foot and access the farm stand via our garden gate situated off the Arroyo de los Chamisos Trail. Most are neighbors and enthusiastic about being able to purchase fresh organic produce from their neighborhood farm. Our farm is part of the Wwoof-USA organization (Willing Workers on Organic Farms), and we welcome young people the world over, who are eager to work and learn at organic farms. We host these young people in 4 small tents, have built an outdoor kitchen and have bathrooms and showers for them in one of the buildings on the property. Quandary #2: According to Code Enforcement Officer James G. Martinez, whom I spoke with recently, city codes don't allow camping on our property. Wwoofers, along with volunteers that we welcome three days a week in the garden, are the labor force that makes the operation of our farm possible, just like many other organic farms selling at the Farmers Market. Question #1: Is it possible to get a variance to be allowed to sell produce at our farm stand? We get an average of 20 people between the hours of 7:00am and 11:00am on Mon., Wed. & Fri., with sales ranging from $75 to $200. Question #2: Is it possible to get permission to have up to 4 people at anytime camp on the land. Most Woofers stay for a couple days to a couple weeks as they tend to visit several farms while in the area. Our farm is flanked on two sides by the Chamisos Subdivision, an association of 53 homes. We are frequently featured in their newsletter, many of the association members are our customers and we recently agreed to host their chicken co-op on our property. 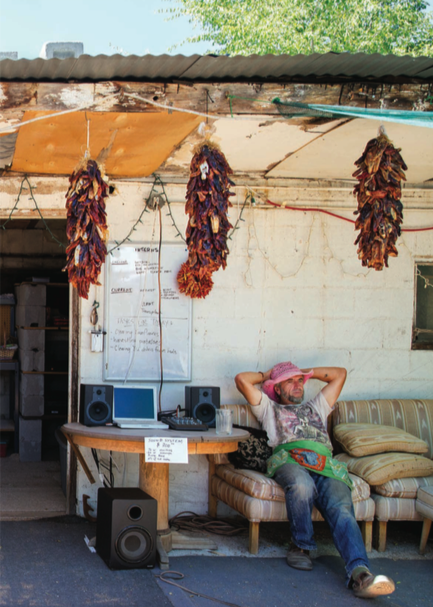 Growing food in our city seems essential to developing a sustainable Santa Fe. Selling that food on site is not only the most sustainable solution but also helps build community and neighborhood resilience. In addition, farm stands are, according to Selena Marroquin, Agritourism Coordinator for Global Center for Cultural Entrepreneurship, "a vital part of agritourism". Earlier last year, I wrote to you seeking your advice on water rights issues related to starting a farm in the city. You were very kind and responsive in referring me to Heather Lamboy and Tamara Baer. I would appreciate hearing any suggestions that you may have on the above mentioned topics.